Danny Berdichevsky's Infusion is a dynamic, high energy instrumental band which blends jazz rock fusion with elements from Latin, Flamenco, Classical, Middle Eastern and African music to produce a rich, melodic and highly original sound. Over the years Danny has formed various bands from "Requiem", one of Israel's first hard rock bands and "Augmented", jazz rock fusion, to his London based Gypsy Jazz duo, "Collage" and "Wizards of Wonderland" (WOW) where he incorporated elements of World music into rock. 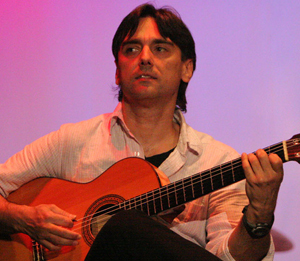 He has worked with very diverse musicians covering a wide range of styles. The concept of Infusion was born over the years as Danny worked with more and more different musicians from diverse musical backgrounds and delved deeper into the many musical forms. It became ever clearer to him that he would like to record and perform music that reflects the different styles he plays and where he could involve musicians he has worked with to make music which is honest and original where musicians can express themselves sharing true ability and individuality especially in the present musical climate where set song formulae, sampling and synthetic sounds prevail. Infusion is innovative, honest and in constant evolution.